Comment: As good as two carats of deadly green tsavorite in an extra-long pear shape calling for a courageous owner to show off in a pendant. This gem was cut early after the first discovery of the new, exceptional pushy green grossularite garnet in the Tsavo National Park of Kenya in 1967. 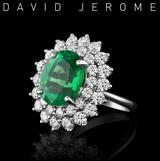 Though usually small, under one carat, the newly named 'Tsavorite' took the world in a storm that ended 2009 with the murder of C.R. Bridges, the man who discovered it. Tragic as this was, it is not surprising that this gem raised local tempers with its unique beauty under finite supply. 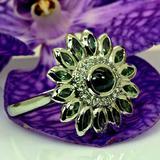 This slender elegant pear shape is a prime example for the captivating beauty of Tsavorite. Since its primary cut this gem has travelled the world and a few surface notches attest to its age. They are not visible without lens and we do not suggest a re-cut but leave this divinely shaped, almost 10mm long gem as it is. Extra deep vivid green. IGI report, global shipping, grading documents and rainforest protection are included in our prices.